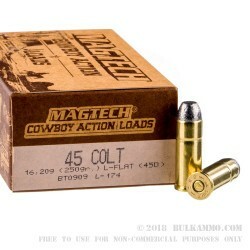 A very straightforward, slightly lower power .45 long colt ammunition made by MagTech, and custom designed to be as close as possible to the original for cowboy action shooting. 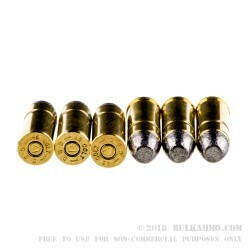 This is a 250 grain flat nosed lead bullet in Boxer primed brass, and is made to be as close to the original style as possible. 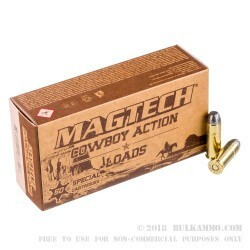 It is part of the Cowboy Action Loads line from Mag-Tech. Most Long Colt loads have been very expensive of late and this round offers a good compromise between pricing and performance. The performance makes it worth every penny of a higher priced brand, the reliability and consistency makes it a very good purchase for the price it actually is sold at. It does have slightly harder primers, made for reliable ignition ion guns that have heavy springs, so take into account that this round was built for historical accuracy and competition level rigs for those who are serious about Cowboy Action shooting events. 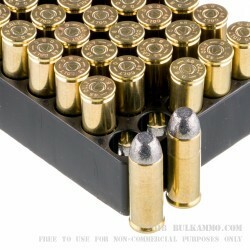 This Mag-Tech load is built to delivery comfortable shooting out guns that are used to shooting punishing rounds. This cartridge makes 760 feet per second and deliver 325 ft. lbs. of energy at the muzzle.